The M-Audio Oxygen 25 (MKIV), Oxygen 49 (MKIV), and Oxygen 61 (MKIV) are professional pad and keyboard controllers designed for hands-on software control, sequencing, and performance. This article walks through a number of Frequently Asked Questions about the M-Audio Oxygen Series controllers. What software is included with the Oxygen (MKIV) Series? I do not have the authorization codes for my software. What do I do? What operating systems are supported? Do I need to install any drivers? Will the transport buttons, rotary knobs, and faders control my DAW automatically? What are the default MIDI notes for the pads. Can I change the notes sent by the pads? How do I reset the pads? Can I control my virtual instruments while the Oxygen is set to control my DAW? Can I use the Oxygen (MKIV) series controller with my iPad? What software does the Oxygen Series come with? All keyboards in the Oxygen (MKIV) series include download codes for Ableton Live Lite 9 and SONiVOX Twist - Spectral Morphing Synthesizer. If your authorization code is lost or misplaced, contact M-Audio Technical Support by visiting www.m-audio.com/support for further assistance. The Oxygen (MKIV) series is class compliant, which means you don’t have to download or install any drivers. Being class compliant also means that the Oxygen (MKIV) series will run on all current and future operating systems for PC and Mac. The Oxygen (MKIV) series controllers have DirectLink compatibility. Rather than assigning parameters one by one, DirectLink automatically maps the Oxygen’s controls to many of the most frequently used digital audio workstations. When used with a supported DAW, you can control the transport, mixing controls (faders and panning) and virtual instrument or signal processing plug-in parameters. Current DirectLink support includes Reason, Cubase, Ableton, Pro Tools, Garageband, and Logic. To enable DirectLink with your Oxygen, you may need to install some additional software. Visit www.m-audio.com/directlink to download the necessary DirectLink driver personalities for your specific DAW. The pads on the Oxygen (MKIV) series are capable of transmitting Note ON/OFF and velocity messages. 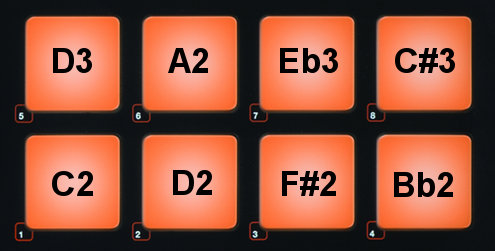 You can shift all 8 pads simultaneously by a single note or octave. Hold SHIFT and both OCTAVE buttons. The pads will light up and then dim to show that they have been reset. Can I control my virtual instruments while the Oxygen is already controlling my DAW? 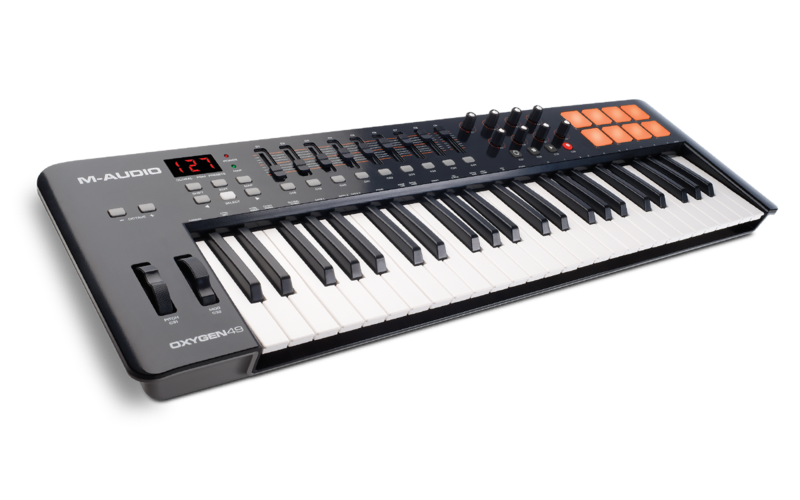 Each keyboard in the Oxygen (MKIV) series has an AUTO button that allows you to switch between controlling your DAW (in the ON position) or your virtual instruments (in the OFF position). Can I use the Oxygen (MKIV) series controller with my iPad?? Yes! Any Oxygen (MKIV) series keyboard will be fully powered by your iOS device’s bus power. To use an Oxygen (MKIV) series keyboard with an iPad, connect it using the iPad Camera Connection kit (sold separately). Hold the "-" and "+" OCTAVE buttons while powering the keyboard on, and it will restore the controller to the factory default settings.